Here at DCLC we believe in the importance of developing a positive self-concept, self-respect, self-control, and respect for others. We acknowledge that children learn these traits best through a variety of environmental influences, beginning play, which is children’s work. Children learn best through hands-on experiences and active participation with their surroundings. One of the many ways we achieve this is through language and literacy education, music and movement, creative art, math and science, dramatic play, computer activities, and more. You guessed it, all the things necessary to make an exploration expert out of your child. One of our goals is to provide comprehensive early childhood and family development services that empower children and families to reach their full potential; thus emphasis is placed on caring for the whole child, physically, emotionally, socially, cognitively, and spiritually. 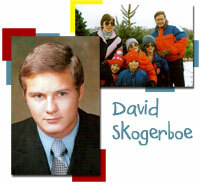 David's Christian Learning Center was founded by the late David Skogerboe. He was a young member of St. Matthew Lutheran Church in Columbia Heights, Minnesota. David had an intense interest in outreach programs and proposed that St. Matthew open a daycare center for children and their families in the community. It was David's eventual dream to have a "Learning Center." With many blessings from God, David's dream became a reality in September of 2001. David's was initially funded through the memorial monies from David Skogerboe and the support of the St. Matthew Lutheran Church congregation. The ministry has tripled its size since the doors first opened in 2001. We come alongside the family in preparing the children for Christian living in this world. They will learn of the love of Christ through our demonstration of the simplicity and awesomeness of God's love. We do this through a variety of activities such as Bible storybooks, games, and thematic units that support the Bible focus and the learning centers. Most importantly however, is the example set by the child’s classroom teacher. In addition to that is the commitment each has in their own life of leading a life that exemplifies Christ. We support all of the Early Childhood philosophies, but we give the program that extra spiritual twist which is lacking in most Early Childhood programs; a vital piece to completing the whole child. Research has proven that if a child does not receive a Christian education before the age of five with some regularity, they may never know Jesus as an adult. Our goal is to give children the start they need in this area. After all, our eternal outcome in this life is where it all closes out. Knowing the person of Christ is a pivotal point in the development of the child - alongside of meeting all their other needs. Every week children are taught different Bible stories integrated with pre-kindergarten topics for broad based learning. For example, we may teach the Bible story of "Jonah and the Whale" together with an "ocean" unit. If we study Noah's Ark, we may combine it with a "weather" or "zoo" chapter. The Gospel is the focus and foundation of the curriculum. We also introduce the children to American Sign Language as infants and continue through preschool. We offer Introductory Spanish, such as the alphabet, the calendar (days, months) and other topical words related to our weekly lessons to our preschoolers. Feel free to click on this Sample Block Plan to get an idea of our daily curriculum. In addition to serving our children, our goal is to knit families together. The Learning Center frequently schedules events for families which help build a community. Often new and lasting friendships are developed, resources are shared among the parents, and opportunities for social time outside of the classroom become available for kids. For instance, we host an annual Mother's day tea and a Father's day BBQ. The families and staff walk together in the Columbia Heights parade every June. We also have several potlucks - including a summer picnic, a Thanksgiving feast and a Christmas party. In 2006 we added community service events to our annual agenda. We believe in teaching children outside of our classrooms, demonstrating how to give back to our community, encouraging families to work together and showing God's love through selfless acts of service. Parents are an important and active part of the Learning Center. There is parent representation on the Learning Center Board and a parent-lead event committee and advisory board. The Director meets with parents at quarterly parent meetings and teachers meet individually with parents twice a year. You can find comfort in knowing that our commitment is to assist you in raising your child by providing them with a loving, caring, and protective environment. We believe that we can provide children with the necessary life skills needed to live a happy, healthy, and productive life, with Jesus' help.